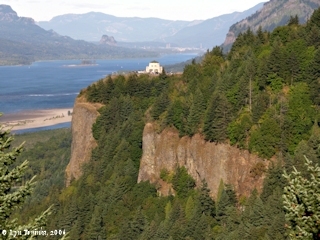 Click image to enlarge Crown Point and Vista House. View from Portland Women's Forum Scenic Viewpoint (formerly Chanticleer Point). Image taken October 22, 2005. Crown Point is a large lava flow feature on the Oregon side of the Columbia River at River Mile (RM) 129, with Rooster Rock at its base and Rooster Rock State Park stetching upstream. Across from Crown Point, on the Washington State side of the Columbia River, lies Steigerwald Lake National Wildlife Refuge and Point Vancouver, the fartest upsream of Lieutenant Broughton in 1792 of the Captain George Vancouver expedition. Upstream of Crown Point is Latourell Falls and Shepperds Dell. Also upstream are Bridal Veil Falls and Multnomah Falls. 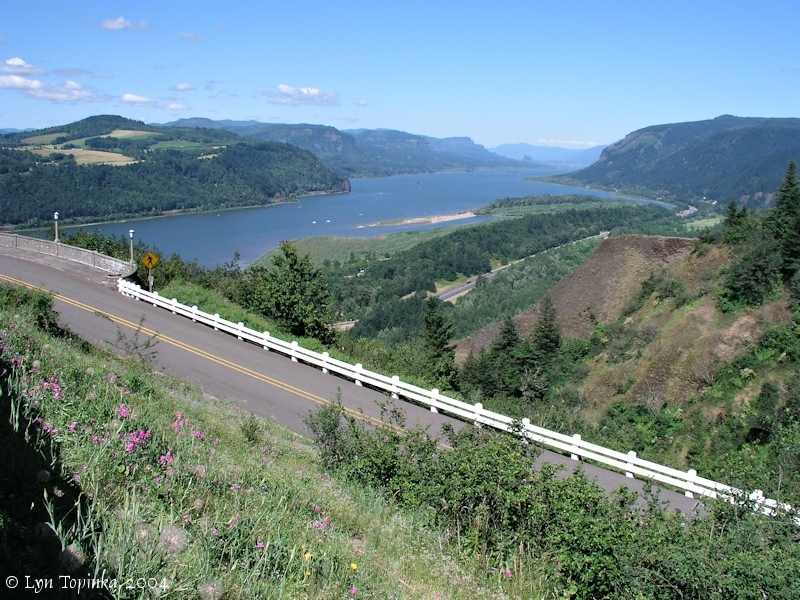 Downstream of Crown Point is Tunnel Point, a pullout along Interstate 84 which presents fantastic views of Crown Point. On top of Crown Point is the famous Vista House. The Historic Columbia River Highway leads to Crown Point and Vista House. 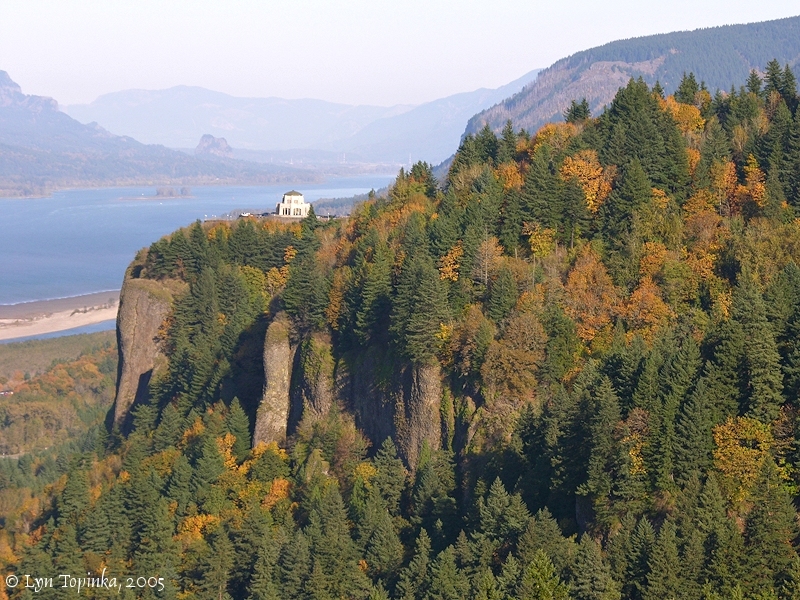 Good views of Crown Point and Vista House can be seen from the Portland Women's Forum Scenic Viewpoint, formerly known as "Chanticleer Point", located downstream. Click image to enlarge Crown Point, Oregon, as seen from downstream of Cape Horn, Washington. Crown Point as seen from Washington State Highway-14 pullout, downstream of Cape Horn, Washington. Image taken June 25, 2003. Crown Point represents a lava flow which filled an ancient channel of the Columbia River 14.5 million years ago to a total thickness of nearly 700 feet. . Crown Point is an excellent exposure of thick (over 500 feet) Priest Rapids intracanyon flow overlying a bedded Priest Rapids hyaloclastite (more than 140 feet). The Priest Rapids is a member of the Wanapum Basalt of the Columbia River Basalt Group (CRBG), and erupted in the middle Miocene. The lack of basalt pillows at the lava/hyaloclastite contact suggests that the hyaloclastite was not excessively wet when the lava flowed over it. Rooster Rock, on the downstream side of Crown Point, is a landslide block which came off of the west side of Crown Point. The landslide scar is visible on the cliff above. "The Columbia River Gorge is a spectacular river canyon cutting the only sea-level route through the Cascade Mountain Range. It's 80 miles long and up to 4,000 feet deep with the north canyon walls in Washington State and the south canyon walls in Oregon State. Six to 17 million years ago, the Columbia River Plateau was created by a series of basalt flows. The flows covered 164,000 square kilometers -- portions of northeast Oregon, southwest Washington and western Idaho, and consisted of about 300 individual flows. As it flooded the regions lowest areas, it filled canyons and permanently altered the Columbia River's path on several occasions. 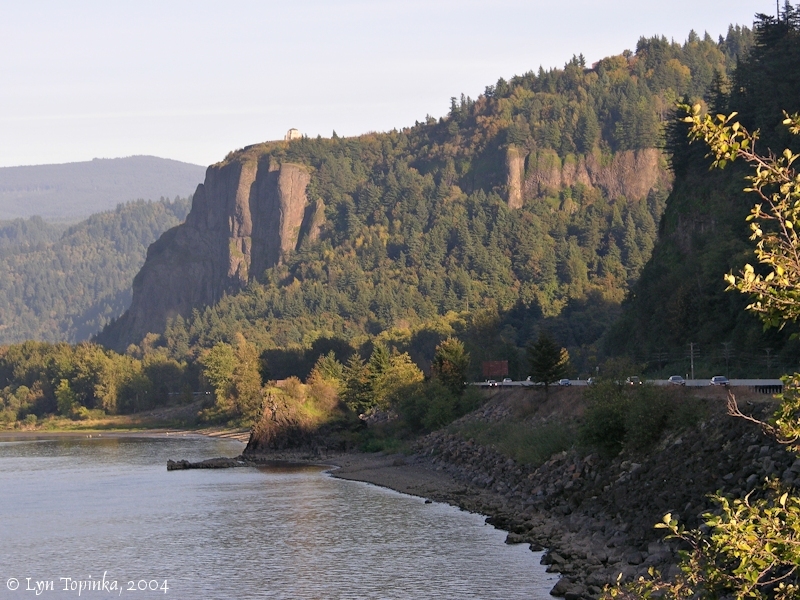 Today, these flows are exposed along the cliffs of the Columbia River Gorge. These lava flows altered the course of the Columbia River many times, one of them creating today's Crown Point. Fourteen million years ago a massive eruption of the Columbia River basalt began near the present Washington-Idaho border. Lava from this eruption flowed westward and was funneled into the Columbia Gorge, flowing down the ancient channel beneath Vista House. The lava eventually covered over 50,000 square kilometers of the Pacific Northwest, and completely filled and overtopped the old Columbia River channel, obliterating it. Part of that ancient lava-filled channel now is exposed at Crown Point. 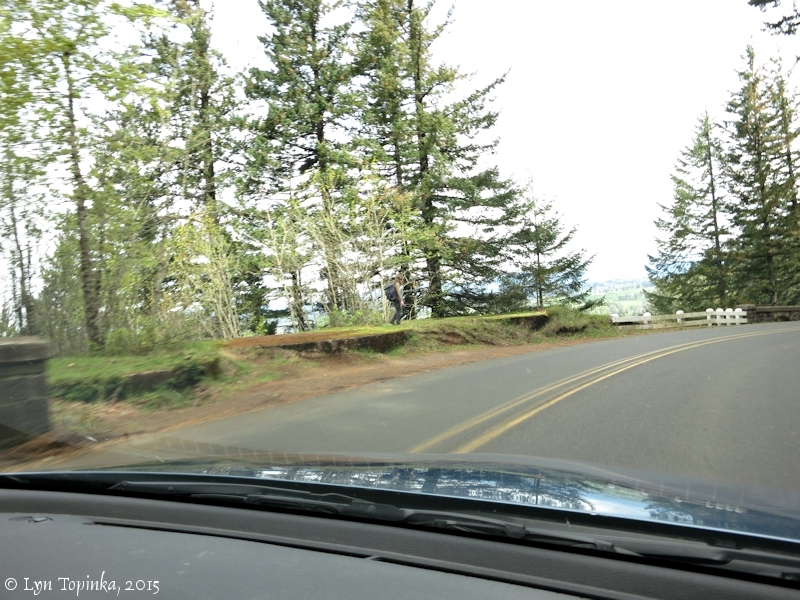 It extends from near the freeway level to Vista House, a height of nearly 650 feet. There are two layers of material in the channel that tell the story of how that river channel was abandoned. The lower 180 feet of the channel is a product of the lava eruption but it is not a lava flow. 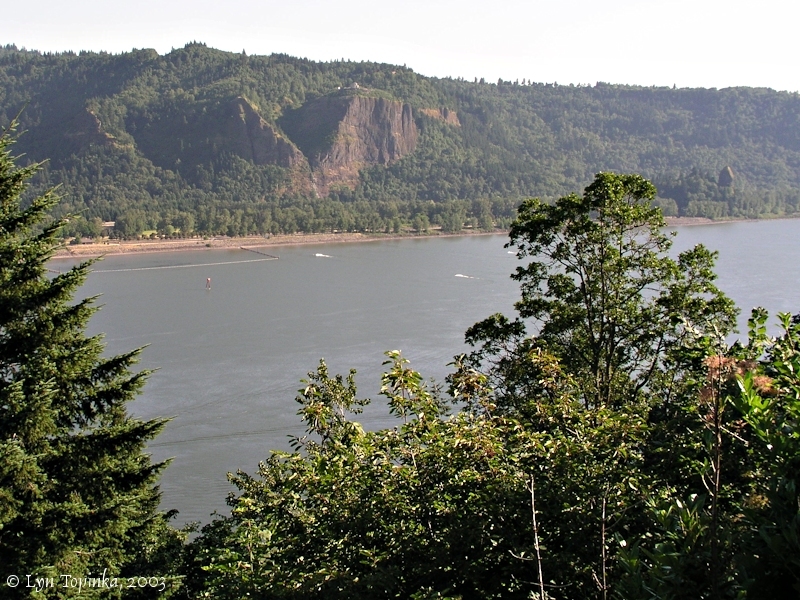 As the 14 million year old lava approached the ancient Columbia River Gorge, it encountered the Columbia River. When the lava advanced into the water, the water chilled the molten lava along its margins causing the lava to freeze and violently shatter into sand to cobble size fragments. These fragments flowed ahead of the advancing lava as a slurry of chilled lava particles and water. The remains of this slurry fill the lower part of the channel. The liquid lava then flowed over the slurry filling and eventually overtopping the channel, forcing the Columbia River to find a new route. The view from Vista House on the old scenic highway not only overlooks the 14 million year old channel but several other channels of the Columbia River including the present day one." The 700-foot-high Crown Point was inundated during peak of the Missoula Floods. Flood waters eroded away softer material, highlighting the spectacular cliff face of the lava flow. 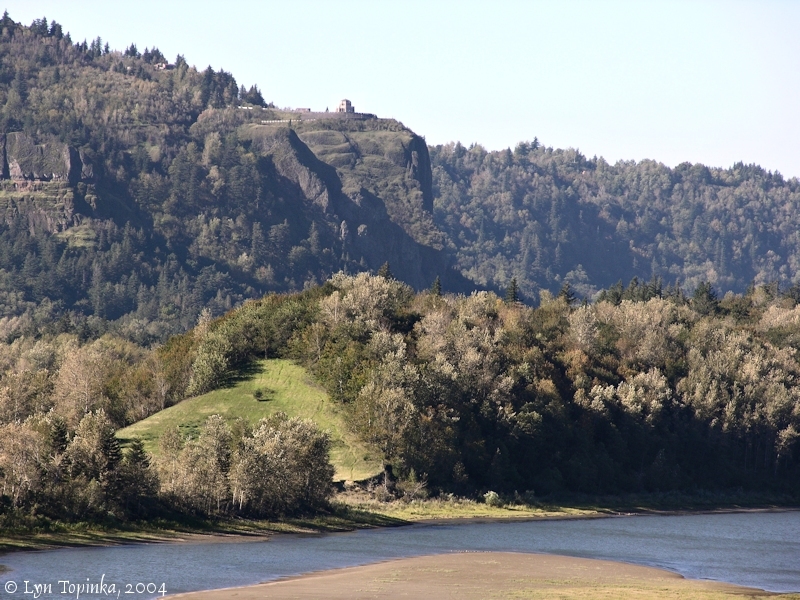 Lewis and Clark's campsite of November 2, 1805 was near Rooster Rock and below Crown Point. 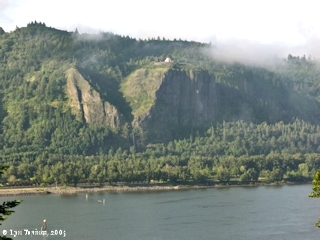 Click image to enlarge Crown Point, Rooster Rock, and Rooster Rock State Park as seen from near Cape Horn, Washington. View from Washington Highway 14. Image taken June 25, 2003. 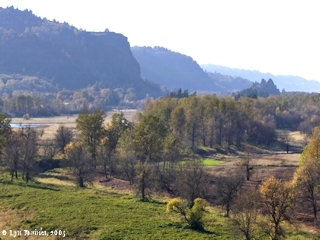 Noted Historian Lewis L. McArthur in Oregon Geographic Names (2003), wrote that he was unable to determine when the name "Crown Point" was first used. McArthur writes that the original settler of the area, Lorens Lund, homesteaded on the high ground near and including Crown Point, and, according to Lund's daughter, Lorens Lund called the top of the bluff "The Point". Lund later donated the land for Vista House. Credit for the name "Crown Point" is often given to Marshall Dana of the Oregon Journal who used the name when discussing plans for Vista House. A passage from the 1940 publication "Oregon, End of the Trail", by the Works Projects Administration (WPA) of the State of Oregon. "... Winding along the forested mountainside the highway reaches CROWN POINT, 167.3 m., 725 feet above the river on an overhanging rocky promontory. The highway makes a wide curve, in the center of which is the VISTA HOUSE. This impressive stone structure, a modern adaptation of the English Tudor style of architecture, modified to conform to the character and topography of the landscape, was built at a cost of $100,000. 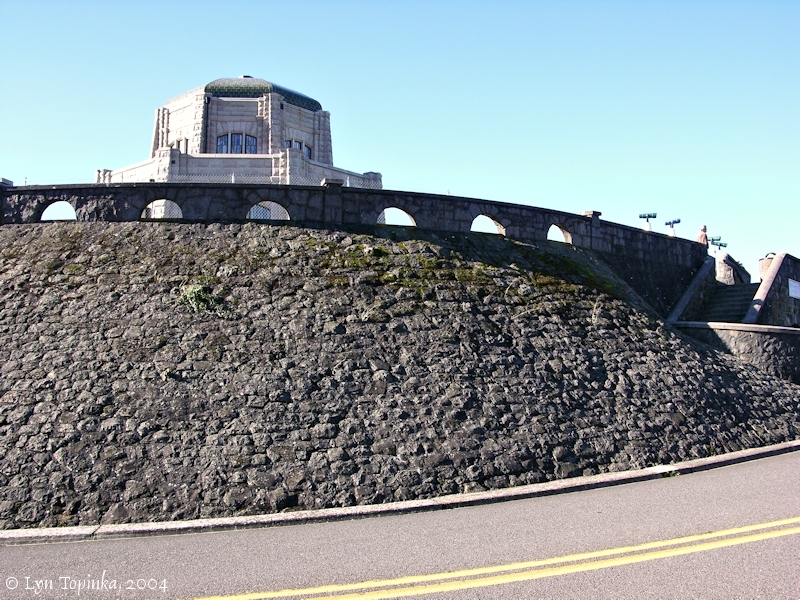 The foundation about the base of the Vista House is laid in Italian-style dry masonry, no mortar having been used. Men were imported from Italy to work here and elsewhere along the highway. The windswept height, once known as THOR'S CROWN, commands a view of the river east and west for many miles. ..."
Besides "Thor's Crown", another name used for Crown Point during the early 1900s was "Thor's Heights". H.H. Riddell, in his 1914 article "The Columbia River Highway" (Mazama, vol.4, no.3, December 1914), used "Thor's Point". The Columbia River, Its History, Its Myths, Its Scenery, Its Commerce, by William Denison Lyman, 1909, G.P. Putnam's Sons, New York, p.359-360. "... A few miles below Cape Horn it becomes apparent that we are about to issue from the mountain pass. The heights have fallen away. Deep valleys appear and many habitations attest the cultivable character of the region. But as if to show that she has not exhausted her resources, wonder-working Nature has set one more masterpiece in the long line, and this is Rooster Rock, with a mighty rampart of rock adjoining and closing the southern horizon. Together they mark the western limit of the mountains. That rampart, which was once well named Cape Eternity, though the name does not seem to have been preserved, is a sheer massive precipice of a thousand feet. Though not nearly so high as some of the cliffs above, it is not surpassed by any for the appearance of solid and massive power. Rooster Rock is distinguished by a singular and exquisite beauty, rather than magnitude or grandeur. It is only three hundred and fifty feet high, but in form and colour and alternation of rock and trees it is one of the most beautiful objects on the River. ..."
Click image to enlarge Rooster Rock and Crown Point. 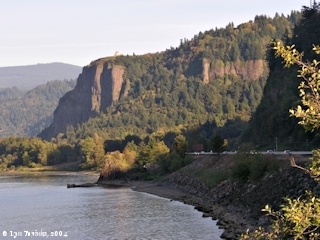 Rooster Rock and Rooster Rock State Park are at the base of Crown Point, as seen from Interstate-84, Oregon, Tunnel Pullout. Vista House is just visible perched on top of Crown Point. Image taken September 26, 2004. Click image to enlarge Crown Point, Oregon, as seen from Tunnel Point, I-84, Portland, Oregon. Image taken October 10, 2004. Click image to enlarge View upstream from the Portland Women's Forum Scenic Viewpoint. View of Crown Point and Vista House, with Skamania Island, Beacon Rock, and the Bonneville Dam complex in the background. Image taken September 23, 2006. 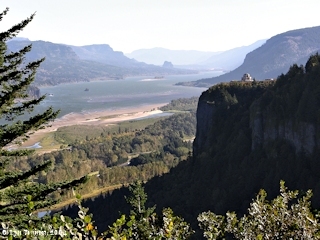 Click image to enlarge Columbia River Gorge and Crown Point. View from The Portland Womans Forum Scenic View (formerly Chanticleer Point). Image taken October 11, 2004. 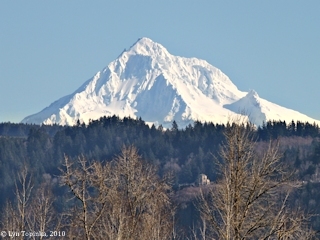 Click image to enlarge Crown Point as seen from Shepperd's Dell Bridge, Oregon. Image taken October 22, 2005. 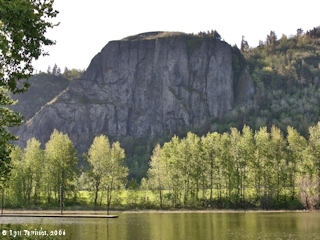 Click image to enlarge Crown Point cliff face as seen from Rooster Rock State Park, Oregon. Image taken April 24, 2006. Click image to enlarge Crown Point as seen from Rooster Rock State Park, Oregon. Image taken April 24, 2006. 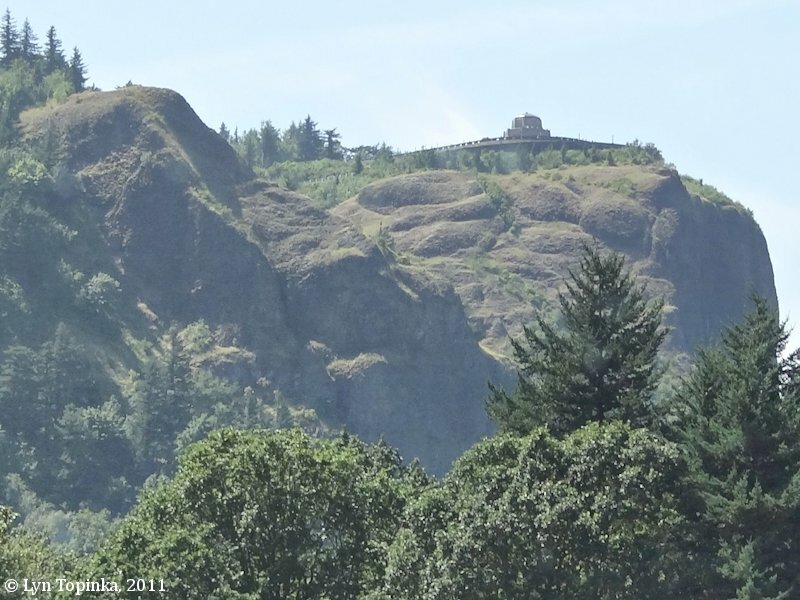 Click image to enlarge Crown Point, Oregon. View from moving car, Interstate 84, Oregon. Image taken April 24, 2006. Click image to enlarge Crown Point, eastern view, Oregon. View from moving car, Interstate 84, Oregon. Image taken August 12, 2011. 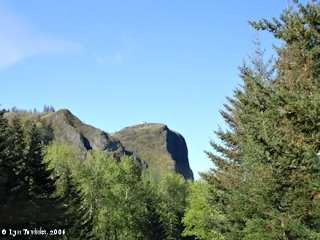 Click image to enlarge Crown Point as seen from Bridal Veil. Image taken October 11, 2004. Pullouts along Washington State Highway 14, west of the Cape Horn Viewpoint, provide spectacular views of Vista House and Crown Point. 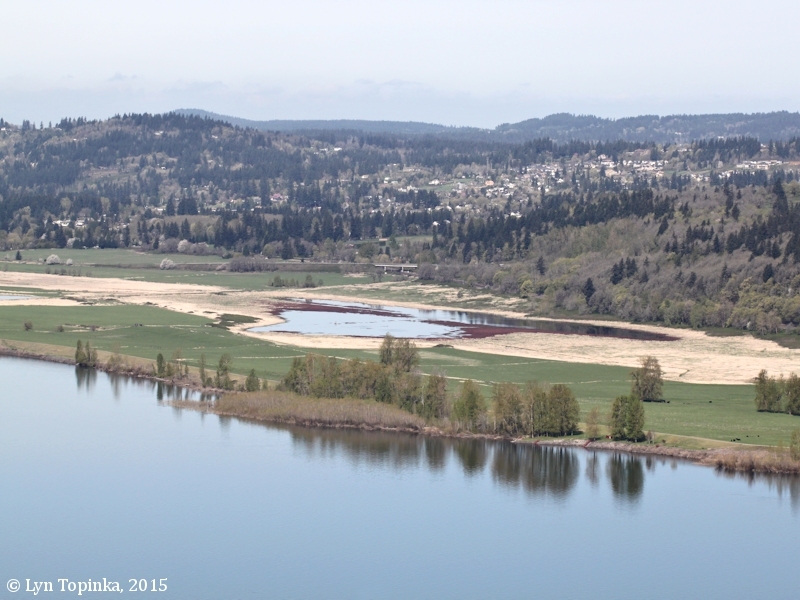 Crown Point and Vista House can also be seen from Steigerwald Lake National Wildlife Refuge, just east of Washougal. Click image to enlarge Early morning, Crown Point. Note waterfall on the left. View from Washington State Highway 14. Image taken May 24, 2005. 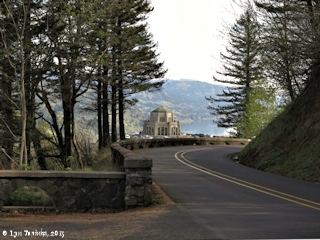 Click image to enlarge Crown Point and Vista House, Oregon, as seen from Washington State Highway 14. Image taken, June 19, 2005. 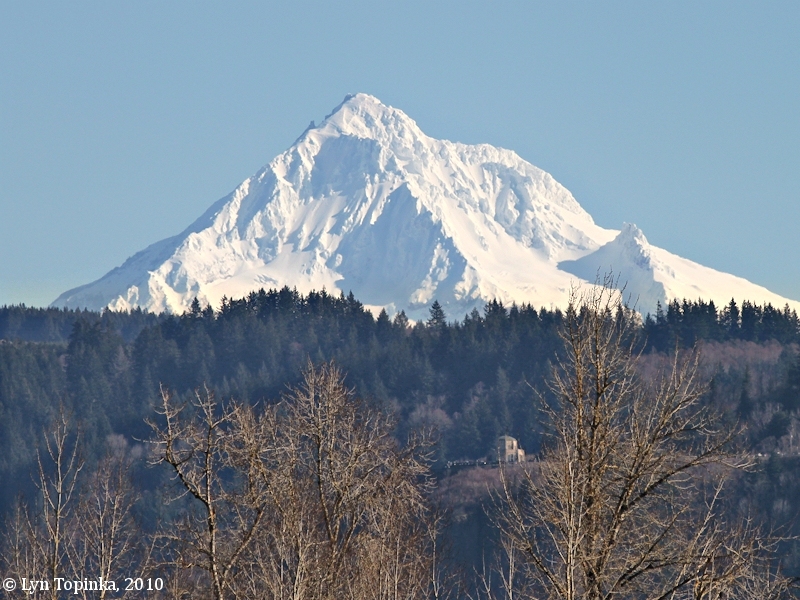 Click image to enlarge Mount Hood, Crown Point, and Vista House as seen from Steigerwald Lake NWR, Washington. Image taken February 21, 2010. The Crown Point Chalet was built in 1915 by Mrs. Margaret Henderson, who was also a part of the history of Chanticleer Inn and the short-lived Latourell Falls Chalet. 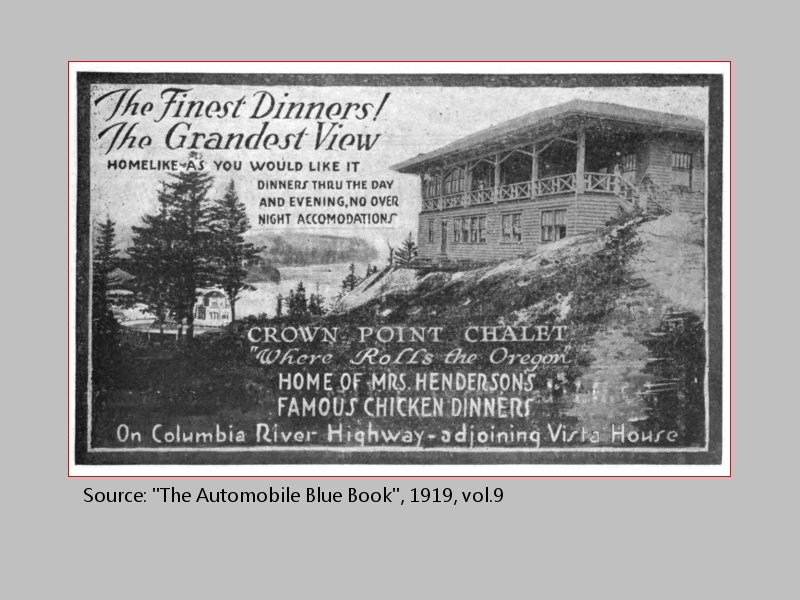 The Crown Point Chalet was located on the south side of Crown Point, on a bluff overlooking Vista House and the point. Crown Point Chalet closed in 1927 with the declining health of Mrs. Henderson. The building was demolished in the 1950s. 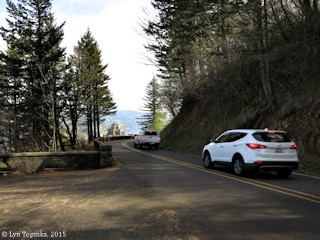 A narrow road to the south of the Vista House parking area leads to the Chalet's location. Click image to enlarge Penny Postcard: Crown Point Chalet, ca.1920. Penny Postcard, ca.1920, "Mrs. Henderson's Chalet, Crown Point." Photo copyright Cross & Dimmitt. In the private collection of Lyn Topinka. Click image to enlarge Advertisement: Crown Point Chalet, 1919. Source: "The Automobile Blue Book", 1919, vol.9. 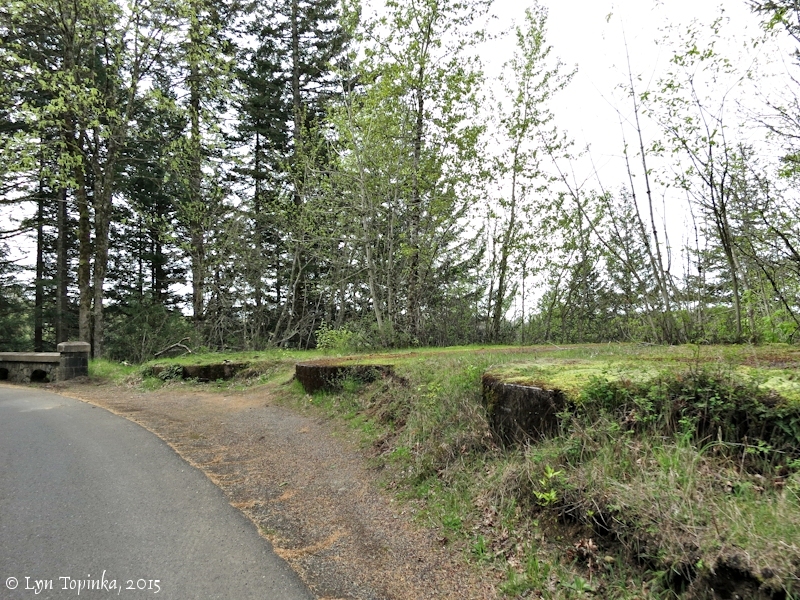 Click image to enlarge Road to Crown Point Chalet, Crown Point, Oregon. Image taken March 3, 2013. 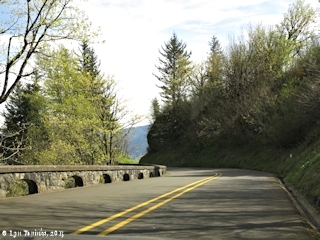 Click image to enlarge Historic Columbia River Highway on the east side of the Crown Point viaduct, heading into the Crown Point Loops. View east, Columbia River Gorge. Image taken June 27, 2004. Click image to enlarge Crown Point Figure-eight Loops, Historic Columbia River Highway, Oregon. Image taken March 30, 2015. "On leaving the Visat House site, the Crown Point Loops State Park is entered approximately three quarters of a mile eastward. This tract includes the entire Crown Point Loops area as it winds down the steep slopes. It is described as being in Section 30, Township 1 North of Range 5 East, W.M., Multnomah County, containing 62.75 acres, a gift to the State by Multnomah County, the deed date November 10, 1935. The tract is now a unit of Talbot State Park. The area is a beautiful roadside forest of Doublas fir, Grand (White) fir, Western red Cedar, Broadleaf maple, alder and a generous distribution of the native Western dogwood, whose white, early flowering livens these clean, attractive waysides with a touch of richness and appealing beauty that is much admired, and greatly appreciated in the springtime, and their abundant red fruiting and highly colored leaves are equally enjoyable in autumn. Along the Columbia River there is often a second flowering of the dogwoods which occurs in the early autumn." "These Loops should be kept in their natural state with no man-made intrusions." 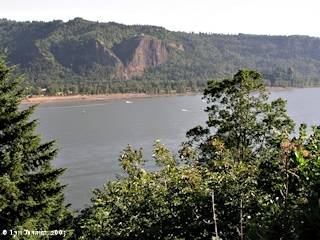 "This new state park area can well be described as being the western end of the Columbia Gorge. It is twenty four miles from Portland, marked by metes and bounds as being in Section 30, Township 1 North of Range 5 East, W.M., Multnomah County, containing 28.71 acres, which includes the Vista House. Of this area 0.79 acres were a gift to the State by Multnomah County, the deed date August 15, 1938, 0.92 acres were a gift to the State by the City of Portland, deed dated December 27, 1938, and 27 acres were purchased from Mary N. Gilbaugh, deed dated November 23, 1945. Crown Point, with its Vista House, is probably the best known and most widely publicized view point anywhere along the Columbia River Highway. It is situated on an immense resistive rock formation that extends well out toward the river, with recessed basins on either side. A situation that permits of wonderful, unobstructed views from the Vista House, both up and down stream. Looking to the west, the immediate foreground, reveals the top of Rooster Rock. Further to the west, the river is broad, with many low-water sand bars, some naked, some willowed. Both sides of the stream have steep, rock slopes to the uplands which are patterned with prosperous farms, forming a delightfully peaceful scene that merges into the distant rising background of the Coast Range. In the eastward foreground are naked rock formations, channeled sloughs, tree covered sand mounds, islands and river bars, all clearly seen beside the Oregon river bottom farms. Fort Rock [today's Angel's Rest], a point on the not idstant Oregon shore, reaches nearly to the river cutting off the upstream view, with Larch Mountain looking over its rising right flank. On the Washington side, the elevated sloping plateau is also checkered with farms which reach well up on the slopes of Mount Zion [Biddle Butte]. Cape Horn, tunneled for the railroad, projects prominently to the stream side, with Beacon Rock and the point beyond, intercepting the river view above Fort Rock point. This picturesque, composite view of river, hills and extensive cultural features, as seen from Crown Point, is a most pleasing and edifying introduction to the scenic Columbia Gorge end the state parks that are shead. It was a timely, as well as a bold, forward looking movement on the part of Multnomah County and the City of Portland, to acquire this sightly view point and construct thereon the picturesque edifice that has become so widely known, and done so much toward introducing the scenic worth of the Columbia Gorge to the traveling public. 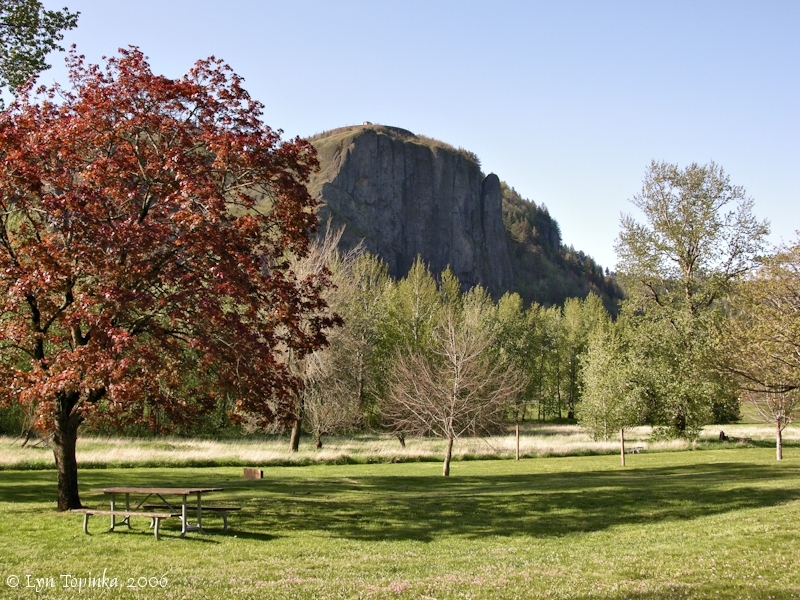 Both the County and City are to commended for authoritatively transferring this property to the State as permanent features of the Columbia Gorge State Park setting." "Modern latrines should be installed. Building needs general repair." Crown Point State Park is located on the old Columbia River Highway, 24 miles east of Portland in Multnomah County. 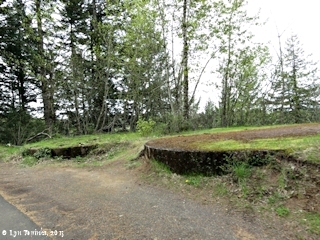 The first area obtained for this park was a gift of 1.71 acres from Multnomah County and the city of Portland in 1938. On this land is the famous Vista House, located on a promontory jutting out from the south wall of the Columbia River Canyon. This gift was followed by two additional gifts from Multnomah County in 1952, another in 1958 and a fourth in 1962, totaling 18.02 acres. Nine areas, totaling 250.68 acres, were purchased between the years 1945 and 1962, making a total of 270.41 acres in the park at the close of 1963. A log cabin located on the Dimmitt property, the most recently purchased parcel, was dismantled and the land was leveled in order to provide more use space. The park land is covered with fir timber interspersed with some maple, alder, willow and other trees of lesser value. 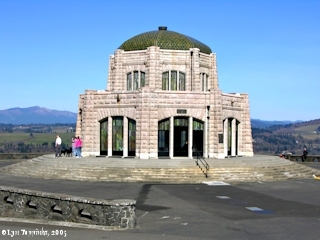 The distinctive, picturesque, old Vista House at Crown Point was built in 1916 with funds supplied by the County, augmented by small donations from many school children and other interested parties. The building project was completed through the efforts of Samuel Lancaster, John B. Yeon, Marshall Dana and others. The Vista House has won the esteem of the thousands of people who visit it each year. Many have written to tell of their appreciation of the spectacular, panoramic views of the Columbia River and the canyon as viewed from the vantage point of the majestic, old Vista House. A bronze plaque was installed in the Vista House in 1929 by the Trail Seekers Council to honor Lieutenant W. R. Broughton of Captain Vancouver's Expedition and the naming of Mt. Hood on October 30, 1792. Also, the Daughters of the American Revolution was given permission in December, 1940, to erect a plaque in the Vista House to the memory of Madam Dorion, who, with her husband, acted as Indian guide and interpreter for the Lewis and Clark Expedition at the beginning of the 19th century. In 1918, while the property was still under the jurisdiction of Multnomah County and the city of Portland, a concession was started in the Vista House. Such items as tobacco, cigars, candy, gum, etc., were sold to the traveling public. This convenience was continued after the property was acquired by the state. The concessionaire was responsible for the maintenance of the building. This was an unsatisfactory arrangement as income to the state was no greater than the cost of the janitorial service and employment of the overseer. Because of the badly run-down condition of the building in 1942, a contract was given to Jud Beardsley for extensive repairs to the Vista House. The job, Contract 2508, was completed in October, 1942. Installation of a heating plant was completed in 1955 at a cost of $7,178.39, which eliminated the moisture problem in the building. The Highway Commission chose to advertise in 1947 for a new concessionaire. As a result of bids received February 3, 1947, the concession was let to the Multnomah Falls Gift Shop, the highest bidder. Mr. and Mrs. Jack Flaucher, owners of the Gift Shop, were to pay 10-1/2 % of gross take from sales at the concession and furnish the janitorial work and such necessary supplies. This arrangement resulted in $7,551.27 being paid for the year 1947. Revenue decreased each successive year. Due to this condition, permission was given the concessionaire to close the Vista House during the months of January and February of each year beginning in 1952. These were two months of slow business, due to little travel on the highway, and they were costly months for heating the building. The concessionaire was permitted to reduce his payments to the state by $250 to cover the cost of fuel, commencing the winter of 1954-55. This lease arrangement was continued by the Flauchers until 1961, when they sold their contract. The purchaser, Kyle Smith, continued under the contract with no change in the terms. 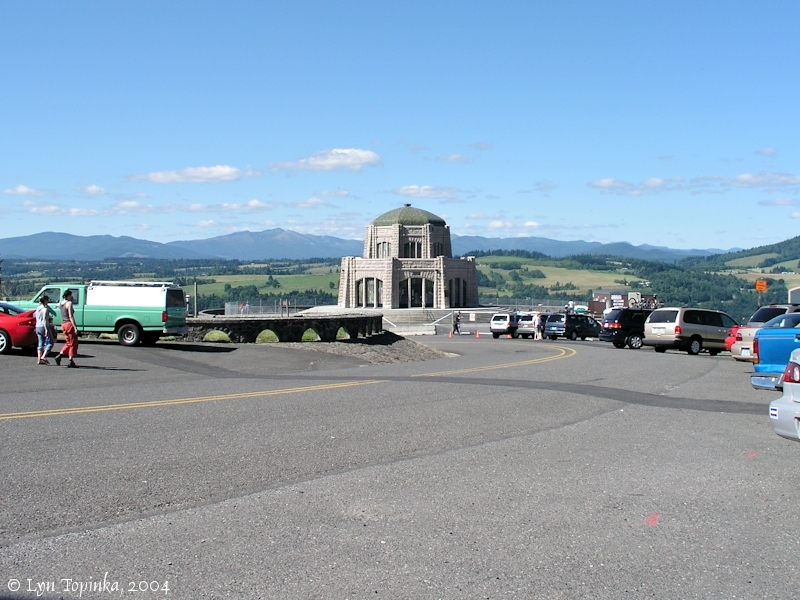 A suit contesting the right of the state to lease the Vista House for a concession was filed in 1957 by M. R. and Janice M. Moore, owners of a similar business located on adjoining property. The Court found in favor of the state. Water for this park is obtained from the Corbett Water District. Visitors at Crown Point during 1963 totaled 380,114." On the upstream side of Crown Point is an unnamed stream and unnamed falls, nicely visible during heavy rains. This falls is one of many falls in the Columbia River Gorge. The "Crown Point Falls" can be seen from pullouts along Washington State 14, or from the Oregon side along Interstate 84. The falls drops into Mirror Lake. 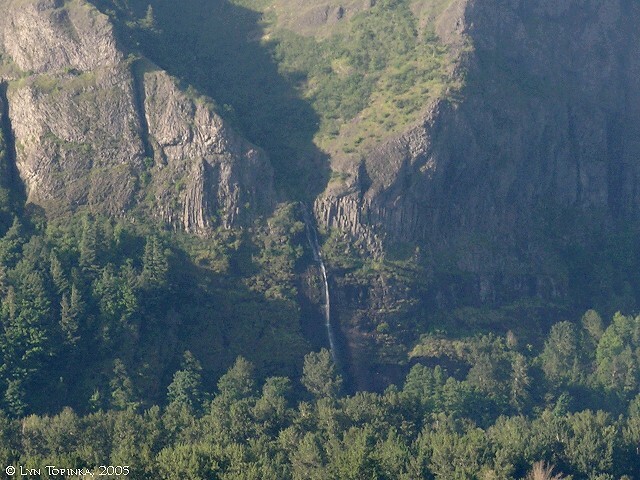 Click image to enlarge Crown Point waterfall, Oregon. View from Washington State Highway 14. Image taken May 24, 2005. According to "PDXHistory.com" website (2006), between Vista House and the Crown Point Chalet was "Gardner's Cafe" which opened in 1922 as Johnson’s Confectionary. In later years it was known as Vista Cafe. It was torn down by the U.S. Forest Service in 1963. "In the late 1920s, George and Nettie Johnson opened an ice cream parlor that soon became Johnson's Vista Cafe. Situated in an ideal location within an easy stroll of the Vista House, the restaurant profited from the many visitors who stopped there. In the 1930s, the United States Weather Bureau established a weather station in a small back room in the cafe. The station provided hourly reports to the main Portland weather station until it closed on October 21, 1945. When tour busses unloaded passengers at the restaurant, the weather station employees often had to "pitch in" to help with the dishes or other restaurant chores." Source: Clarence E. Mershon, 2006, "The Columbia River Highway, From the Sea to the Wheat Fields of Eastern Oregon, 1913-1928", Guardian Peaks Enterprises. Click image to enlarge Penny Postcard: Aerial view, Crown Point and Vista House, Oregon, with Crown Point Chalet, ca.1920. Penny Postcard, ca.1920, "Vista House - Crown Point 'On the Columbia River Highway'." Photo by A.M. Prentiss. Published by The Rose City News Co., Portland, Oregon. Card #7. In the private collection of Lyn Topinka. Building lower right corner is the "Crown Point Chalet". Between Vista House and the Crown Point Chalet is "Gardner's Cafe". Click image to enlarge Vista House view from area of the former Gardner's Cafe (Johnson's Vista Cafe), Crown Point, Oregon. Image taken June 27, 2004. Crown Point was a centerpiece on the Historic Columbia River Highway. On June 6, 1916 at the Highway dedication, President Woodrow Wilson pushed a button in Washington D.C. and unfurled a flag at Crown Point. On the same day the ground was overturned, beginning construction of the world-famous Vista House. Click image to enlarge Penny Postcard: Crown Point and Vista House, Oregon, ca.1930. Penny Postcard, ca.1930, "Crown Point and Vista House, Columbia River Highway, Oregon". Caption on back reads: "Crown Point 25.5 miles from Portland, Oregon. 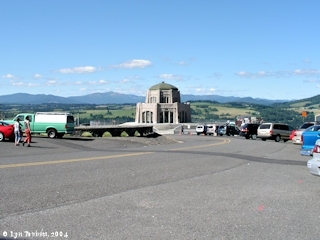 A view of 35 miles both East and West can be seen from Vista House." Copyright Cross & Dimmitt. Published by Angelus Commercial Studio, Portland, Oregon. Card #2. In the private collection of Lyn Topinka. 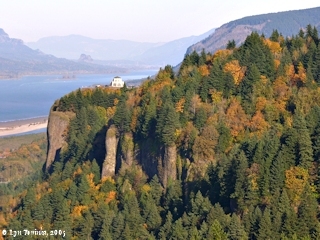 Click image to enlarge Approaching Crown Point and Vista House, Historic Columbia River Highway. 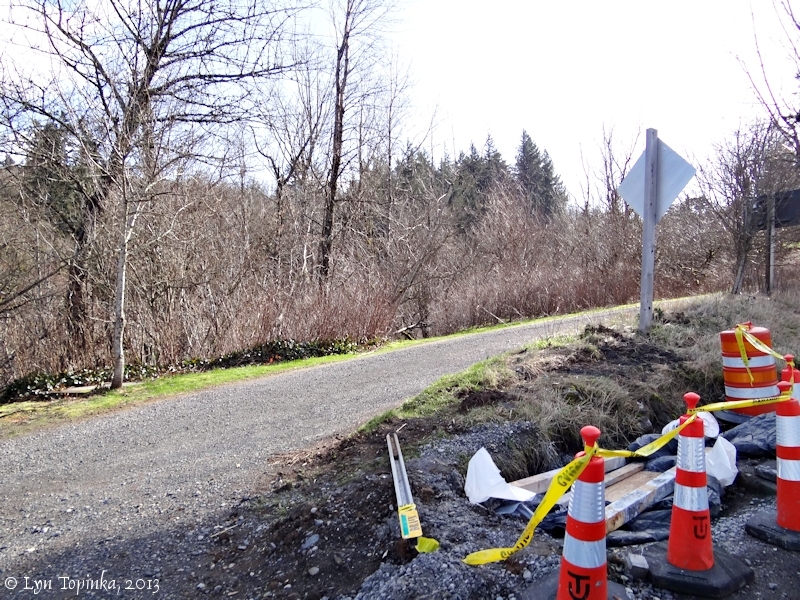 Image taken March 30, 2015. Click image to enlarge Crown Point and Vista House viaduct, Historic Columbia River Highway. Image taken October 11, 2004. 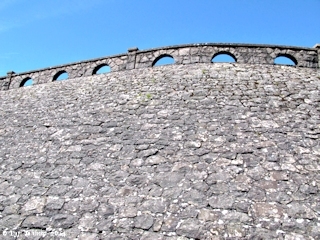 Click image to enlarge Crown Point Viaduct, Historic Columbia River Highway. Image taken March 30, 2015. Click image to enlarge Crown Point Viaduct, Historic Columbia River Highway. Image taken June 30, 2014. Latourell Creek merges with Young's Creek (Shepperd's Dell) and flows westward across the flats of Rooster Rock State Park, forming Mirror Lake. Mirror Lake then flows past the base of Crown Point where it merges with the Columbia at Columbia River Mile (RM) 129, at the Rooster Rock boat ramp. 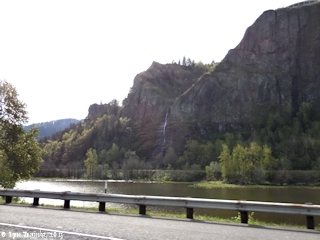 Click image to enlarge Mirror Lake, waterfall, and Crown Point as seen from Interstate 84, Oregon. View from moving car. Image taken April 9, 2015. 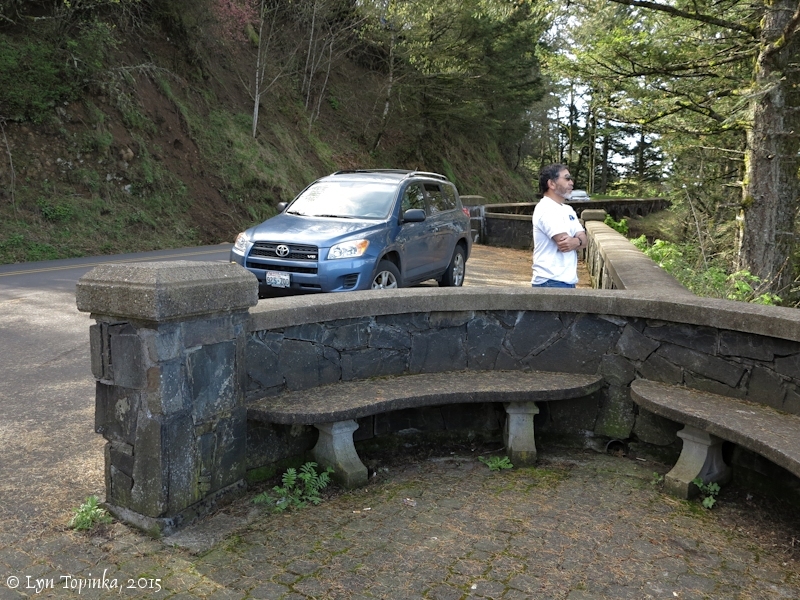 Click image to enlarge Pedestrian Overlook before Crown Point, Historic Columbia River Highway, Oregon. Image taken March 30, 2015. 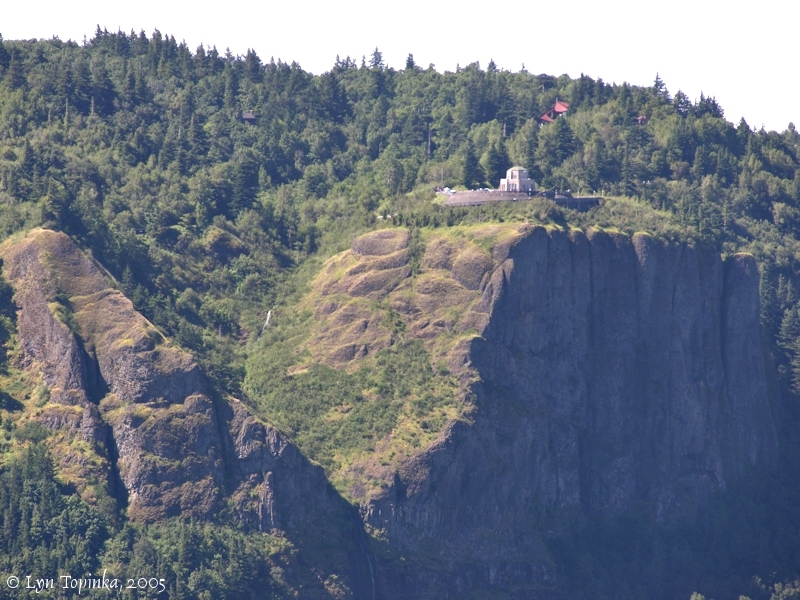 Click image to enlarge Vista House as seen from the Pedestrian Overlook before Crown Point, Historic Columbia River Highway, Oregon. Image taken March 30, 2015. 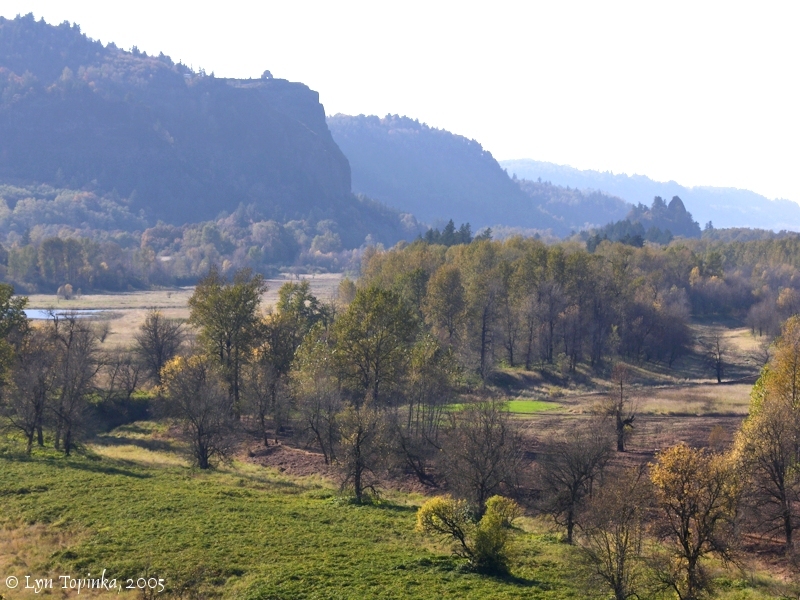 Click image to enlarge Steigerwald Lake NWR, Washington, as seen from the Pedestrian Overlook before Crown Point, Historic Columbia River Highway, Oregon. Image taken March 30, 2015. 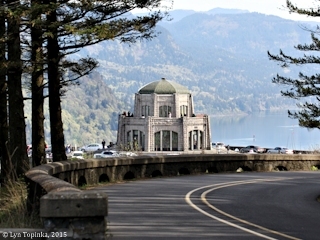 The Vista House was built in 1916 at the same time as the Columbia River Highway - today known as the Historic Columbia River Highway. It is still the only route to Crown Point. 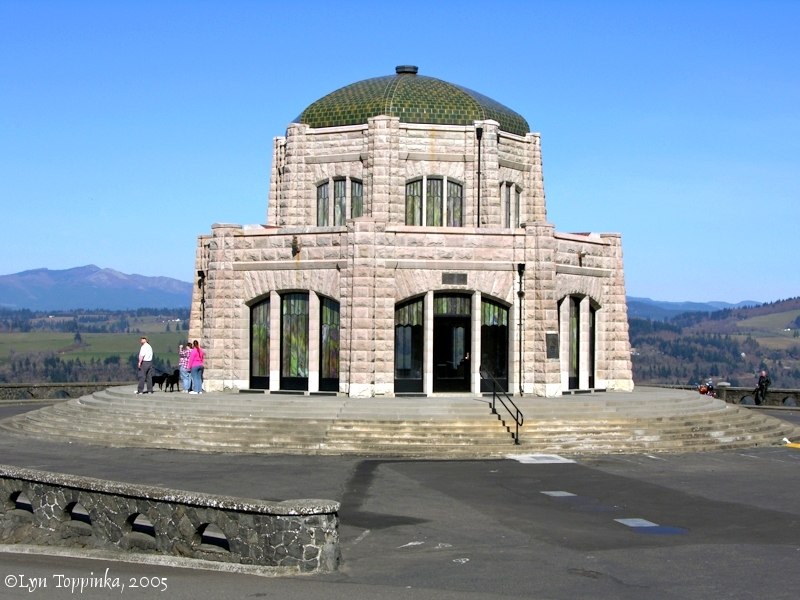 Click image to enlarge Vista House at Crown Point, Historic Columbia River Highway, Oregon. Image taken March 6, 2005. 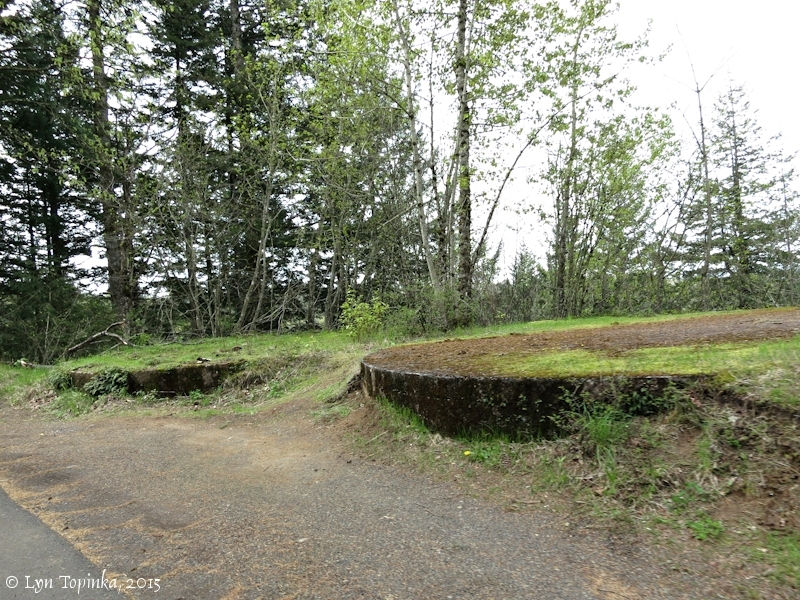 Click image to enlarge Water storage tanks west of Crown Point, Historic Columbia River Highway, Oregon. Image taken April 10, 2015. Good views of the Columbia River can be seen from Crown Point and Vista House. 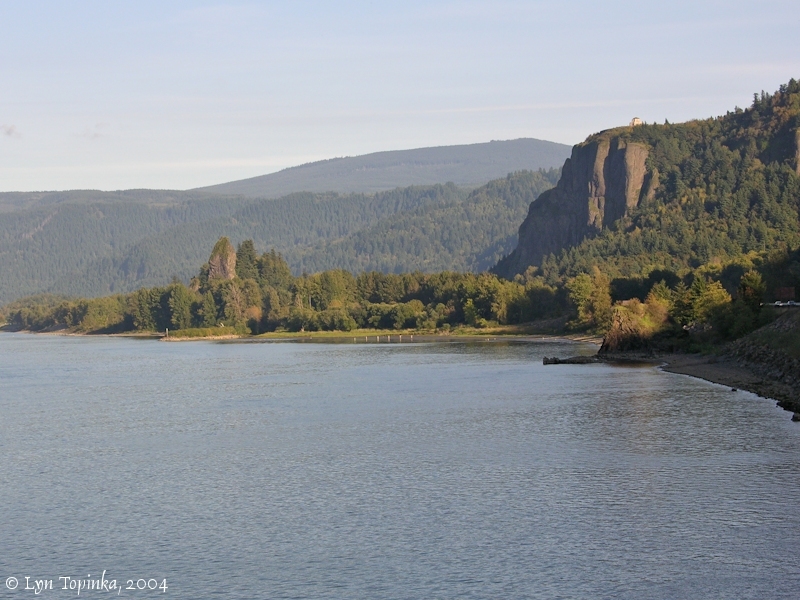 Upstream views include Rooster Rock and Rooster Rock State Park, Shepperds Dell, Young Creek, Sand Island, Dalton Point, Beacon Rock, and Cape Horn and Phoca Rock. 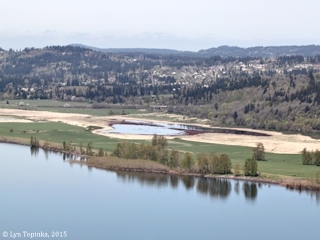 Across the Columbia is Steigerwald Lake and Point Vancouver. Downstream views include Reed Island, Cottonwood Beach, and Tunnel Point. Off in the distance is Washougal, Washington. Click image to enlarge Penny Postcard: Crown Point before Vista House, Oregon, ca.1916. Penny Postcard, ca.1916, "Crown Point and Rooster Rock. 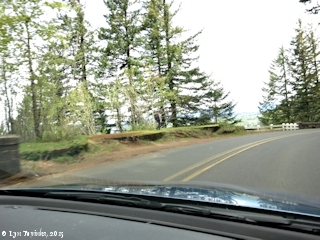 Along Columbia River Highway, Oregon." Published by the Oregon News Company. Card #O-16. In the private collection of Lyn Topinka. Building lower right corner is the "Crown Point Chalet", which was built in 1915 and closed in 1927. The building was demolished in the 1950s. Between Vista House and the Crown Point Chalet is "Gardner's Cafe". Gardner’s Cafe opened in 1922 as Johnson’s Confectionary. In later years it was known as Vista Cafe. It was torn down by the Forest Service in 1963. Click image to enlarge Penny Postcard: Vista House, Crown Point, Oregon, ca.1943. Penny Postcard, Postmarked 1943, "Vista House, Columbia River Highway, Oregon." The Crown Point Chalet is visible in the background on the right above Vista House. Image copyright Angelus Studio. Published by Wesley Andrews Co., Portland, Oregon. Card #859. Card is postmarked August 18, 1943. In the private collection of Lyn Topinka. Click image to enlarge Penny Postcard: Crown Point and Vista House, Oregon, from below, ca.1920. Penny Postcard, ca.1920, "Crown Point, 'On the Columbia River Highway', and Vista House from Columbia River, Over 600 Feet Below.". Photo by A.M. Prentiss. Published by the Rose City News Co., Portland, Oregon. Card #27. In the private collection of Lyn Topinka. Caption on back reads: "Crown Point, 25 miles from Portland, Oregon. 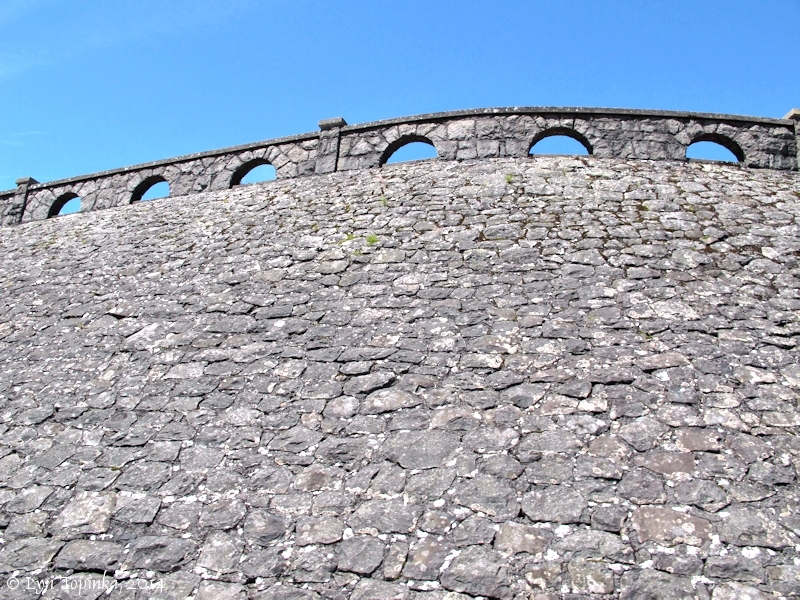 The summit of Crown Point covers and area of about two acres and is 725 feet above sea level. It is famous for its magnificent view of 25 miles both east and west of the mighty Columbia River. 'Vista House', on the summit of the crest, erected as a memorial to pioneers, and also as a resting place for Highway visitors.". Click image to enlarge Penny Postcard: View of the Columbia River Gorge from the Historic Columbia River Highway, Crown Point, Oregon, ca.1920. Penny Postcard, ca.1920, "Columbia Gorge looking East from Crown Point, Columbia River Highway, Oregon." Image Copyright Weister Co. Published by Chas. A. Lipscheutz Co., Portland, Oregon. Card #325. In the private collection of Lyn Topinka. Caption on back reads: "Columbia Gorge from Crown Point. 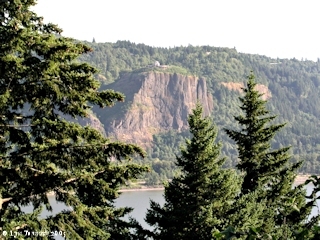 Columbia Gorge from Crown Point showing Cape Horn and Castle Rock in the distance. 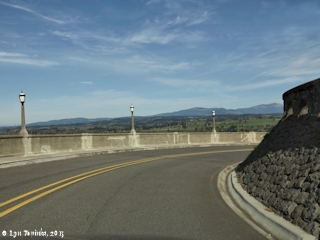 This view shows the concrete supports on the brink of Thor's Heights, and is one of the most prominent view-points along the Columbia River."